Determining how to best mobilise public funds is essential for sustainable development—particularly for developing countries. A holistic approach to tax policy, centred on economic growth, is key. The UN Sustainable Development Goals (SDGs)—or ‘Global Goals’—serve as an ambitious and essential set of universal goals and targets, recognising that it is the greatest global challenge and is an indispensable requirement of sustainable development. However, translating the vision of the SDGs into action remains a major challenge. Tax is intrinsically linked to development, providing the revenue that states need to mobilise resources and reinforce national infrastructure. A key misconception, detailed in the ICC paper, is that development could be entirely funded by ‘cracking down’ on tax practices such as base erosion and profit shifting, which ICC is working with other partners to address. According to UN estimates, total revenue lost on account of base erosion and profit shifting amounts to around US$100 billion—a sizeable sum yet not nearly enough to fund implementation of the SDGs. Moreover, these revenues would likely not accrue to those countries most in need of development funds. 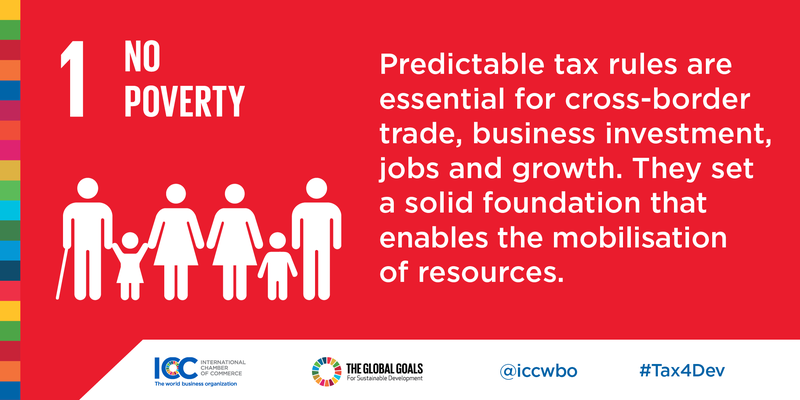 Rather, the most important source of revenue for funding the SDGs is economic growth, and here tax policy can play a pivotal role. Effective tax policies should ensure that profits are taxed where economic value created and that corporate income tax is levied according to where economic activity takes place. Predictable tax rules are essential for cross-border trade, business investment, jobs and growth—all of which enable the mobilisation of resources through revenue collection. In developing countries, the tax revenue accrued from private sector investment is especially valuable. The governments of African countries, for example, depend on foreign corporate payments for 14% of their budget funding. The UN Conference on Trade and Development estimated the total contribution of multinational foreign affiliates to government budgets in developing countries at US$730 billion annually. This revenue collection contributes to national treasuries, which finances national development plans and in turn works towards reducing poverty. Tax policies that promote investment and innovation, particularly in developing economies, go a long way towards attracting foreign direct investment (FDI). Research shows that FDI plays an often critical role in driving productivity and output growth in both developed and developing economies. As companies invest in capital goods and machinery, for example, productivity and output can rise, enabling both decent work and economic growth. Tax policies are instrumental in reducing inequality both within and among countries. 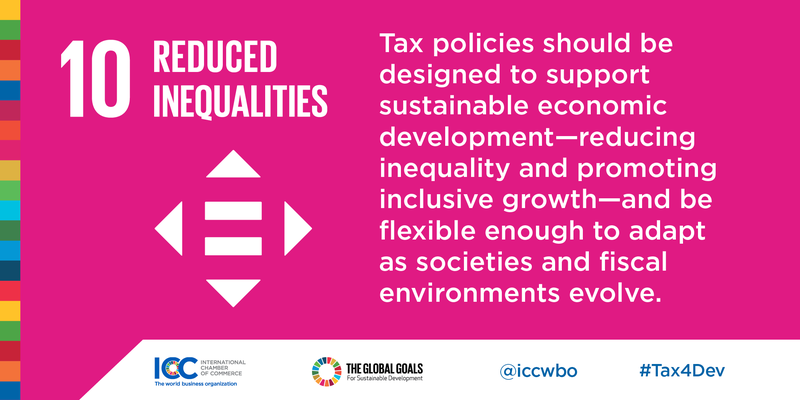 ICC believes that tax policies should be designed to support sustainable economic development, reduce inequality and promote inclusive growth. Moreover, tax policies should be flexible enough to adapt to socio-economic shifts and changes in the fiscal environment in which they operate. Increasing predictability and transparency are often the most effective ways for tax administrations to encourage revenue growth. Tax systems that are clear and reliable encourage investment which, as seen above, fuels productivity and growth. The experience of ‘cooperative compliance’ systems is proof of how effective a relationship of trust between business and governments can be. Rather than adopt adversarial strategies, governments should agree on acceptable forms of tax competition and avoid labelling business as ‘tax avoiders’ when using legislated incentives. In return, businesses should adhere to rules and principles agreed upon by and between countries. To achieve a balanced and efficient tax system that provides for the effective, accountable and transparent institutions that the SDGs call for, greater cooperation between governments and the business community is essential. Just as the global challenges facing us from a rapidly growing population—from the strain on natural resources to employment needs—affect us all, all stakeholders in society must play a role in addressing them. Tax collection is an important tool in encouraging the economic growth that any solutions to these global challenges will necessitate. As a driver of economic growth and employment and an important source of investment, business has an integral role to play in strengthening domestic resource mobilization. 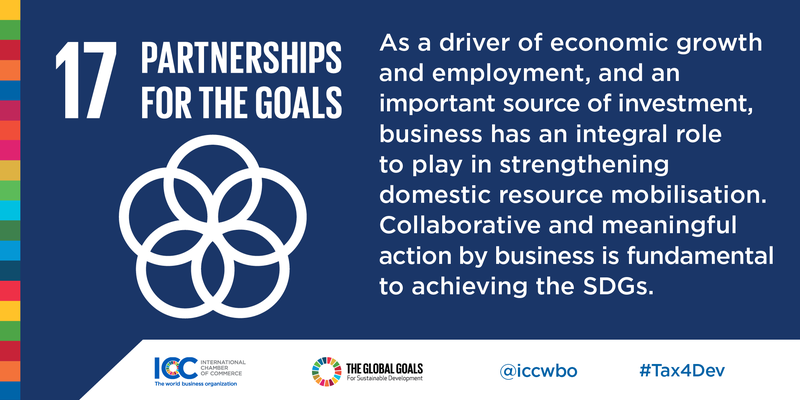 Collaborative and meaningful action by business is fundamental to achieving the SDGs and—as is the case with tax matters—this will only come through trusting partnerships between public and private actors. Read more about ICC’s work with the UN on our website. Climate change and trade agreements Friends or foes?